Nas and Jay-Z were both present at this year Grammy Awards, the premier awards ceremony in the music industry, which celebrates the yearly accomplishments and highlights all music genres. The Grammys are to the music industry what the Oscars are to those in the film industry. And while the rappers (Nas and Jay-Z) both donned a tuxedo that is where the trajectories of their respective careers intersect and depart. 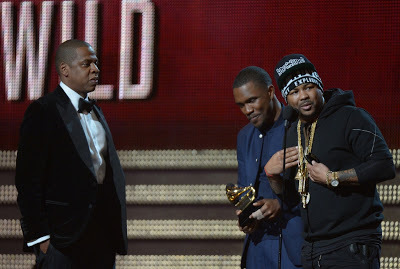 Nas has been nominated 18 times for a Grammy and has failed to win one, while Jay-Z further added to his total by winning in the category for “Best Rap/ Song Collaboration” for his song “No Church in the Wild” which features guest appearances by Frank Ocean and The Dream, alongside his “The Throne” collaborator, Kanye West. While what proceeded was referred to as the “zinger of the night,” Jay-Z’s rather dismissive comments directed at singer the Dream demand a closer reading, one that extends beyond his already substantial, and growing, Grammy collection. When responding to a question centering on the differences between Jay-Z and Nas, a friend of mind offered, “If Jay-Z is the dream, Nas is the work…” While such a comment offers much food for thought and critical engagement, the words allude to some of the topics that are taboo and fraught with tensions within hip-hop culture. At a minimum, it was suggested, Jay-Z’s music represents the kind of aspirational sensibilities that is arguably embedded in the American ethos of reform, transformation, and, ultimately acceptance. It entails a Horatio Alger-like pulling of oneself up by the bootstraps, in the making and remaking of one’s success and push towards the mainstream. The latter half of that comment suggests a kind of blue-collar wisdom and work ethic that is the everyday experience, complete with thoughts and sentiments about a range of topics that firmly establishes the everyday person as someone equally invested and interested in the occurrences and events of the world around them. The comment—“I would like to thank the swap meet for his hat”—is precisely a manifestation of a politics of respectability that seeks in this instance to monitor, comment, admonish, and draw attention to the kinds of difference that are socially and culturally constructed and contested as normal and proper. Here a politics of respectability, as conceived by Evelyn Brooks Higginbotham, points towards a discourse of assimilation that stresses the importance of black people’s (public and private) adherence to morals, manners, and modes of self-presentation consistent with those established and followed by dominant society. This stance on public reform effectively ties the actions, behaviors, attitudes, and very disposition of the individual to the larger collective of the group as a whole. Nowhere it is this more evident than in the clothing guidelines released by CBS directed to attendees of the 55th Grammy Awards. While Dean Obeidallah rightly points out that this dress code requirement is far from being gender neutral, the mere language and existence of said dress code seeks to enforce and institutionalize a set of rules that will undoubtedly be internalized, embodied, and performed by some of the attendees. More to the point, there is the possibility of framing this brief interaction as constituting an experience whereby the legibility of Shawn Carter is contrasted with the illegible body of the Dream. Present, though perhaps, lying underneath the surface, is a lens-affording context to the generational gaps within hip-hop. As my colleague Ryan Jobson accurately notes, there is a distinction to be made “between those who have entered the realm of respectability and those who remain beholden to the vernacular, sartorial, and performative code of the street.” A point for further inquiry is an examination that questions the extent to which the Dream is maintaining and pushing the disruptive politics of an organic intellectual, whereas Jay-Z has become normalized in a myriad of ways. This subversive politics characterizes the Dream’s stance, while Jay-Z's panders to dominant scripts of normalcy. The illegible here can be thought of as the impossibility imbedded in discourses of the remarkable, and transcendence as something that is not readily available to most rappers and/or urban contemporary artists. In his transition from the corner to the corner office in the executive suite, Jay-Z has capitalized and transferred his industry acumen in ways that have not been a possibility for artists like the Dream. Music industry aside, corporate culture is more rigid by comparison in its institutionalization and embodied practices that dictate its own politics of respectability. such defiance and cultural dissidence used to be hallmarks of a once working-class culture and praxis. But Jay (and others) have worked very hard to turn hip hop into a class collaborationist space where such shifts and contradictions are continuously mystified to promote a nationalist fantasy of solidarity. Jay didn't keep up the facade last night however as he was speaking to his bourgeois (and mostly) white audiences. To quote Jay again, "I guess it's only so long fake thugs can pretend." It is important to highlight the politics of respectability and shifts in both preference and tastes as they were manifested in Jay-Z's dismissal of the Dream. This is very much indicative of the kinds of change Jay-Z has embraced vis-a-vis audience when his live show downplays those same changes. The presence and posture of the Dream would and could very well have been Jay-Z circa 1999, the year he won his first Grammy. At a live show, Jay-Z is the lived experience embodied in the creative personae of Shawn Carter. Actor and Comedian Chris Rock once joked that his neighborhood was occupied by four exceptionally talented Black people. Rock and Jay-Z were two of those four exceptional Black people, Eddie Murphy and Mary J. Blige, being the others. His neighbor, on the other hand, a white man, was a dentist, and as Rock points out, it is unknown whether he is a good dentist at that. While this joke locates black exceptionalism alongside white-collar normalcy, the point is not lost when thinking about Jay-Z and his sharing the stage with the Dream. Jay-Z’s pursuit, ascendance, and ownership over the throne exposes a discourse of black exceptionalism and exclusion within hip-hop: a mode of presentation distinguishable by dress, posture, presence, and ultimately, influence. Jay-Z is living the (American) dream, while the Dream, both literally and metaphorically, resides in another neighborhood…those where shopping at the swap meet appears pervasive and acceptable. Wilfredo Gomez is a doctoral student in Anthropology and Education at Teachers College, Columbia University. He can be reached at gomez.wilfredo@gmail.com or via twitter at BazookaGomez84.